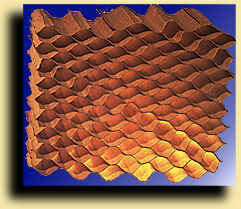 The uses for Bellcomb Honeycomb Panels are limited only by your imagination. In fact, virtually any flat surface which supports weight yet needs to be light is a good candidate for our panels. Largest systems produced: 13'6" high, 8' wide and 53' long semi trailer for transporting and working on racecars. Design requirements included a smooth exterior for graphic display, a tread plate on top of the trailer that would be used as an observation deck, and insulated panels in an entire system that could be assembled quickly but yet be structurally strong enough to withstand the forces associated with over-the-road conditions. Largest panels produced: 5 'x 16 ' x 6.4" - 3/8" plywood skins covered with .050 laminate bonded to 5.5" phenolic impregnated honeycomb. We've also developed several products and processes that involve curved panels (with simple, not compound, curves). We have designed and manufactured several panel types with curves for unique applications. If you have a need for curved panels, please give us a call and discuss this with us. Bellcomb Technologies Inc., 70 North 22nd Ave., Minneapolis, MN 55411. Tel: 612-521-2425; Fax: 612-521-2376.